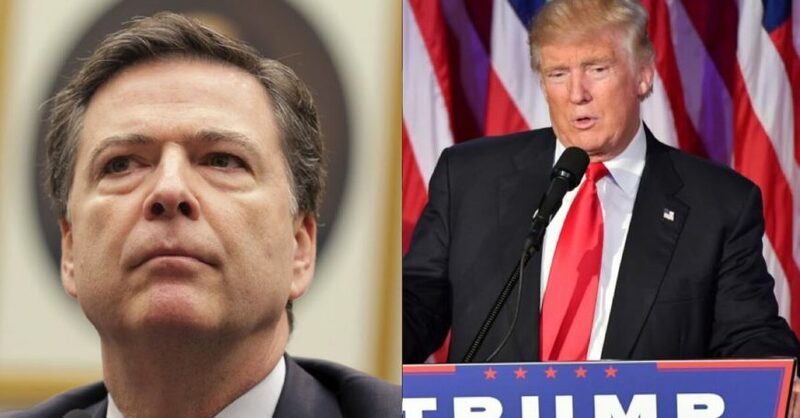 FBI Director James Comey has been caught going around to secret Congressional briefings in “recent weeks” touting the lurid fake “Trump dossier.” He has been claiming that it is a major foundation of the FBI’s investigation of purported Russian collusion with Trump to interfere in the election—months after the FBI had already assessed the “dossier” as non-credible. Comey seems not to grasp the nature of the damage he’s inflicting on the Bureau and its reputation for efficient information-gathering and law enforcement. He is lost in a “wilderness of mirrors,” to use intelligence jargon popularized by the CIA’s legendary anti-communist mole-hunter James Jesus Angleton. Fusion GPS has been revealed to be a pro-Russia lobby by Senator Chuck Grassley (R-IA). British citizen Steele admitted he had larger plans than writing the “dossier” itself, but “really thought that what he had would sway the election“—by using the “dossier” to defeat Trump —said an associate to the BBC. That is called foreign interference in a U.S. election. At this point, here is what we know for sure: the document, which was designed to “prove” that Trump is a Russian agent, originated with a group working on behalf of Russian interests and the Hillary Clinton campaign. Indeed, evidence points to Russian involvement—via Hillary financiers and their hired-gun Russia lobby firm Fusion GPS—in fabricating the “dossier” to discredit Trump by claiming that he was part of a conspiracy to help elect himself president. A Russia expert with 50 years’ experience, writing for Forbes, says the “dossier” reads like it was written by “a Russian trained in the KGB tradition.” Its “poor grammar and shaky spelling” with “KGB-style intelligence reporting” just does not “fit the image” of work by a “highly connected former British intelligence” officer, who was Oxford educated. The Russians may have cobbled the “dossier” material together and passed it on to Fusion GPS and Steele to assemble and edit for the Hillary backers. This means that the House and Senate Intelligence committees have been investigating the wrong alleged scandal. It’s not Trump and his associates who should be under scrutiny; it’s Hillary Clinton and her paid operatives—and their ties to Russia. Has the FBI and its British counterpart, the MI5 security service, opened a case against Steele to investigate him for working for a Russian lobbying firm operating in the U.S.? Or was Steele working undercover for MI6 to infiltrate the Russian lobby? On the other hand, Steele was a “confirmed socialist” in college at Oxford when he was hired by MI6, another point of suspicion for someone who would be dispatched to Moscow as a spy and later serve as head of the Russian desk at MI6, all extremely sensitive positions. Anyone remember the Cambridge Five Soviet spy ring? In a significant development, The Washington Times now reports that Michael D. Cohen, President Trump’s personal attorney, is considering legal action against BuzzFeed, which posted the fraudulent “dossier” that accused Cohen of conspiring with Russian agents. But Cohen never went to Prague—it was a “different Michael Cohen” who went there. Cohen told The Washington Times that he also is considering a lawsuit against Christopher Steele. Cohen was probably chosen to be named in the “dossier” by its fabricators because the pro-Hillary media went viral against him for a campaign comment he made that enraged them. Cohen had dared to defy all the polls predicting Hillary would win, by saying, “says who?”—resulting in an extraordinary but belated post-election apology by The Washington Post. It appears that the only significant Russia connection the media have left is the story that Accuracy in Media first broke in 2015 when we revealed retired Lt. General Michael T. Flynn’s attendance at a public conference in Moscow with Russian president Vladimir Putin. This was to celebrate the 10th anniversary of the propaganda channel “RT” (Russia Today), aka “KGB-TV.” Flynn, former head of the Defense Intelligence Agency, became Trump’s national security adviser before resigning over apparent misrepresentations he made to Vice President Mike Pence about his perfectly appropriate conversations with the Russian ambassador. The idea that Flynn was in any sense a Russia agent was undermined by the contents of his book, The Field of Fight, arguing that Russia and China are behind an “enemy alliance” of countries and movements trying to destroy the U.S.
We have previously pointed out the absurdities in the “dossier.” Some of the major media have acknowledged them as well. The document is a poorly slapped together collage of ridiculous contradictions and absurdities (e.g., Russian senior citizens in Miami as the DNC “hackers”). Newsweek caught one of the most glaring contradictions in the “dossier,” namely one paragraph saying that Russia “fed” Trump compromising intelligence on Hillary Clinton, the next saying they never did (though Newsweek did bungle some other points). But the hostile anti-Trump media claim the opposite, and insinuate that the “Trump dossier” might still be credible by seizing upon any hint of interest by U.S. intelligence, such as FBI director Comey’s secret briefings. Comey, in turn, has nothing else to prop up his fast-fading case for investigating Trump’s associates except by the desperate grasping of straws within the fake “dossier.” No “smoking gun” has ever been found. “We can wait till hell freezes over. The material is not verifiable,” says the Stanford University Russia expert in Forbes. That is because the “dossier is fake news,” he concludes. Indeed, despite its flaws and absurdities, the BBC reports that the FBI has been using the notorious fake “Trump dossier” as its “roadmap” in its baseless investigation of purported collusion between Trump and the Russians to get Trump elected, and of other (phony) allegations of Russian “interference” in the election. Such charges, prominently featured in the major media (about 200 articles on the fake “dossier” in The Washington Post and New York Times alone), are obviously a factor in President Trump’s low approval ratings at the 100-day point in his administration. Based on a recent Washington Post/ABC News poll, Trump would still beat Hillary if the election were held today, including by 43-40 percent in the popular vote. In view of reports that the FBI relied on the discredited “dossier” to justify getting a Foreign Intelligence Surveillance Act (FISA) court warrant against one-time Trump campaign adviser Carter Page, Americans for Limited Government President Rick Manning issued a statement demanding that Comey either step down or be fired. “The FBI’s incredible incompetence and outright complicity with the politicization of government spying removes the last shred of credibility that Director James Comey has and he needs to either resign or be fired,” said Manning. Journalist Bob Woodward of Watergate fame called the “dossier” a “garbage document” and said U.S. intelligence chiefs (thus including FBI’s Comey) should “apologize” to Trump for promoting it. A British director of an investigations firm told Newsweek that the “dossier” is “bulls–t territory” and a “shoddy piece of work.” A U.S. intelligence official called it a “nutty” thing to report to the president. The FBI attempted to pay Steele $50,000 to continue his phony pro-Hillary, anti-Trump “investigation” in October 2016, just before the election. But the increasing media publicity of the shadowy “dossier” forced the Bureau to slink away—until now—with Director Comey seemingly trying to breathe life back into the dead hoax. Comey’s conduct is almost as bizarre as the wild charges in the “Trump dossier.” In fact, he has been promoting the “Trump dossier,” even as his own FBI and the rest of the Intelligence Community (IC) have been “distancing themselves” from it, according to CNN, no friend of Trump. CNN’s report on this issue was immediately twisted around by Business Insider into a fraudulent headline that says the exact opposite, namely that “We just got a huge sign that the US intelligence community believes the Trump dossier is legitimate” (emphasis added). See AIM’s Special Report. “The F.B.I. has spent several months investigating the leads in the dossier, but has yet to confirm any of its most explosive claims” (emphasis added). Intelligence agency officials have consistently denied finding any evidence for such Trump collusion with the Russians, in the “dossier” or in any other material, such as NSA-GCHQ digital wiretaps of Trump associates, despite enormous efforts by the media to suggest otherwise—even to flagrantly contradict the media’s own reporting (see how Business Insider flipped CNN’s report, mentioned above, on its head). But Comey is still promoting—not investigating or critiquing—the fake “dossier,” apparently to justify the Bureau’s use of the document as the basis for its investigation of Trump in the first place. Does Comey seriously believe that Russian senior citizens in Miami hacked the DNC?